*Six Organs' Ben Chasny introduces a new approach to playing and composing music - The Hexadic System doesn’t require the use of a computer or an internet hookup. All that the interested player will need is a copy of ‘The Hexadic System’ book and a regular deck of playing cards* The struggle of habit is a problem in all walks of life, particularly creative work. We don’t always have an instinct to question the systems we are taught but consider the old adage about history being written by the winners. What does that imply about the processes with which we learn? Have alternate teachings been discarded over the years, like the lost gospels of the Bible, when their approach to lesson-making was deemed less worthwhile? “The greatest value of the Hexadic System is to dissolve the musical structures that have been imposed on the player’s mind... Composing music without the outer-self, using the tools of games and divination,” suggests Ben Chasny, in the text of ‘The Hexadic System’. In music, it is generally accepted that perceptions of tonality may vary, depending on where in the world one learns about music (as exemplified by the fundamental differences in Western and Eastern scales). One of the concerns that led to the writing of ‘The Hexadic System’ was to proceed from a multimodal understanding available to 21st century musicians but also to suggest an ordered approach to unfamiliar choices and techniques when composing and playing guitar music. Inspired by explorations in the thinking of Ramon Llull, Gaston Bachelard, Heinrich Agrippa and many other theorists in the various schools of combinatorial and image theory, Chasny’s goal was to make a system of his own, addressing the most important form of decision making in his life - the choices made with his guitar. Over time, writing music on guitar will lead the player in a set of instinctive directions. Virtuosity is a goal but stagnation can easily occur in this pursuit. After a couple decades of playing, Ben is concerned with how to approach the guitar without indulging in time-worn instincts and not simply in improvisation but also in the approach and experience of the guitar from an entirely different perspective - a formatting of chord choices and tonalities not overtly suggested by any tribe thus far in our history. Accessing new choices with the guitar that don’t involve native instinct was the goal of this work - but the principle tool of The Hexadic System is a pack of playing cards, aligned with the notes in the guitar’s neck. To form a systemic alignment, relationships of the cards’ suits to aspects of the Tarot and the Aristotelian cycle of the elements are referenced and two types of card correspondences are examined - Static and Dynamic Correspondence. From here, Chasny suggests several procedures and methods of game play with the card correspondences to illustrate how the Hexadic System can affect the choice of keys, notes, chords, tempo... even ways of interpreting the System to suggest at what time of day composing on a given piece can occur. To further illustrate the solid principles with which the System was constructed, there are over 70 diagrams and illustrations depicting different tunings, chord structures and the explication of the principles of ‘hexafields’ and ‘tonal diagrams’. 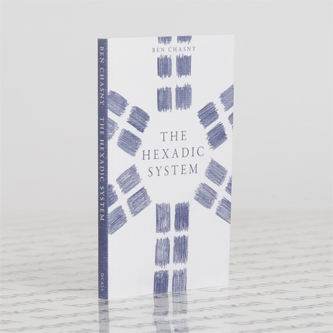 Throughout the book, Chasny takes pains to remind the reader that the Hexadic System is an ‘open system’, leaving necessary room for the creator to make choices with the directions given. A deep respect for ritual as well as a desire to reapproach and invent anew within the compositional mindset imbue all the processes described within ‘The Hexadic System’. Earlier this year, Ben’s band Six Organs Of Admittance used the System to compose, arrange and play the ‘Hexadic’ album but ‘The Hexadic System’ is not simply a manual; it is a scholarly work that approaches the science of music composition using algorhythmic patterns, chance operations and relevant philosophical and occult treatises from history. Ben’s desire to find new ways to make music is part of a deep commitment to his mindset as a musician; seeking surprise and transcendence, to make something new while touching the root of inspiration that has existed for thousands of years. Any regular deck of playing cards can be used to execute the correspondences of the Hexadic System. You can play poker with them, or solitaire. However, to accent the ritual aspect of the Hexadic methodology, a custom deck was designed by Steve Quenell in collaboration with Ben Chasny. Face cards pay tribute to a number of figures who have influenced Six Organs Of Admittance over the years. Markings on the cards specific to the Hexadic System are a part of the custom design of the Hexadic Deck. This deck can be purchased separately from ‘The Hexadic System’ book and is sure to be of interest for enthusiasts of this new system as well as members of the card collector community.